MOSCOW, Idaho – The football field in the Big Sky and Sun Belt conferences is 100 yards long and 160 feet wide, but the way teams use those dimensions differs with the respective leagues. After a trip through the wide-open Big Sky in its first season back as a Football Championship Subdivision team that resulted in a 4-7 overall record and 3-5 league mark, the Idaho Vandals gained insights that guided recruiting this year. On Wednesday’s National Signing Day, Idaho welcomed 10 new players. 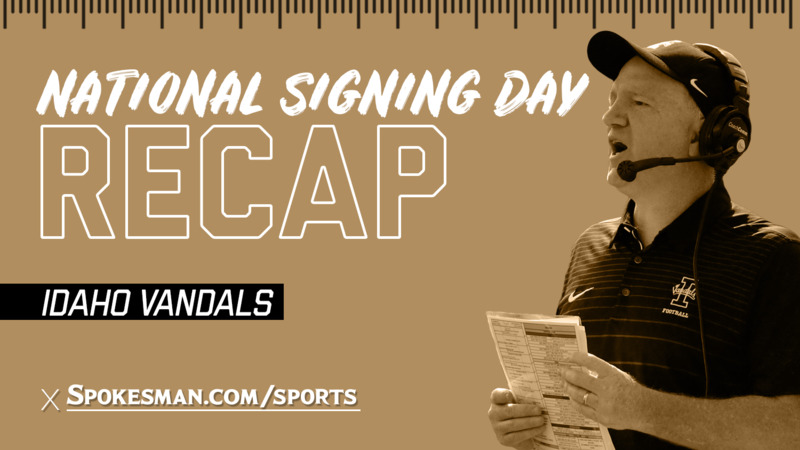 Along with 14 early signees, nine of whom are already enrolled, the Vandals feature a class of 24 newcomers, with possibly one more late signing to occur. About half are expected to contribute immediately, Petrino said. Early standouts include offensive lineman Noah Gunn (6-foot-5, 290 pounds) from Coeur d’Alene. After a year at the Air Force Prep Academy, he transferred to Idaho. He’ll join a group of eight offensive linemen who started a game for the Vandals last year, offensive coordinator Kris Cinkovich said. Safety Satchel Escalante (6-0, 182) of Scottsdale (Arizona) Community College, caught the eye of defensive coordinator Mike Breske. The Vandals recruited five linebackers, including two on Wednesday. All have a chance to play in the fall, Petrino said. Shannon Sully (6-1, 208), from Phoenix’s Brophy Prep, recorded 100 tackles and made five interceptions as a senior. He can play linebacker and safety. Vandals coaches may move junior Christian Elliss from middle to outside linebacker, where he played as a freshman, Petrino said. Hatten’s twin brother, Hayden (6-3, 218), is a tight end similar to sophomore Connor Whitney, who caught 13 passes in 10 games for 135 yards with a touchdown last year. “He’s a very talented guy,” Petrino said of Hayden Hatten, a 247 Sports three-star prospect, who made 38 catches for 763 yards as a high school senior. He caught eight touchdowns, rushed for two and passed for one. Petrino said Hatten and Whitney could give the Vandals a tight end duo reminiscent of Trent Cowan and Deon Watson, who starred in 2016. Idaho also signed another pair of brothers. Defensive lineman Kayode Rufai (6-4, 270), comes to the Vandals after spending three years at Boise State. Mujeeb Rufai (6-0, 198), who redshirted as a freshman with the Broncos, is envisioned as a safety with the Vandals. Others who signed are David Eppinger (5-11, 177), a wide receiver from Chandler, Arizona; Joshua Guzik (6-6, 277), an offensive lineman from Rogers High in Spokane; Nehemiah Parker (6-4, 182), a wide receiver from Mountain Home, Idaho; Dasaeu Puffer (6-4, 181), a wide receiver from Chandler, Arizona; and Jack Schuster (6-4, 187), who played tight end and defensive end for Richland High. Published: Feb. 6, 2019, 6:51 p.m. Updated: Feb. 6, 2019, 7:08 p.m.